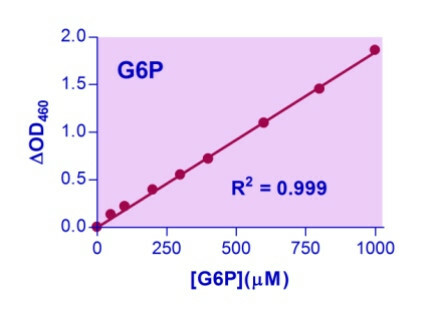 Glucose-6-Phosphate (g6p) is glucose sugar phosphorylated on carbon 6. 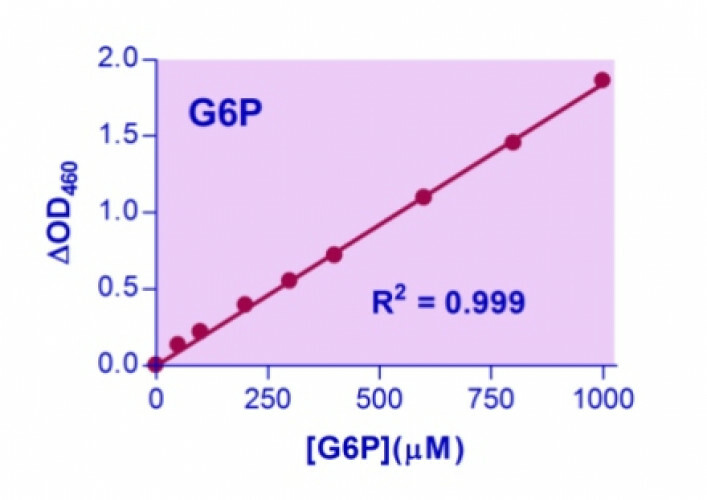 Most of the glucose entering cells is phosphorylated to G6P. G6P has three primary fates within the cell. It lies at the start of two major metabolic pathways: glycolysis and the pentose phosphate pathway. In addition to these metabolic pathways, glucose 6-phosphate may also be converted to glycogen or starch for storage. BioAssay Systems’ Glucose-6-Phosphate Assay Kit provides a simple, and automation-ready procedure for measuring G6P concentration. G6P is oxidized by glucose-6-phosphate dehydrogenase and the formed NADPH is coupled to the formazan (WST-8) chromogen. The intensity of the product color, measured at 460 nm, is proportional to the G6P concentration in the sample. Applications For quantitative determination of glucose-6-phosphate in biological samples.